We have recently acquired an OCT (ocular coherence tomographer) which is like an ultrasound for the eye. This procedure is quick, painless and invaluable is assisting with diagnosis and follow up of certain eye diseases including macular degeneration and glaucoma. 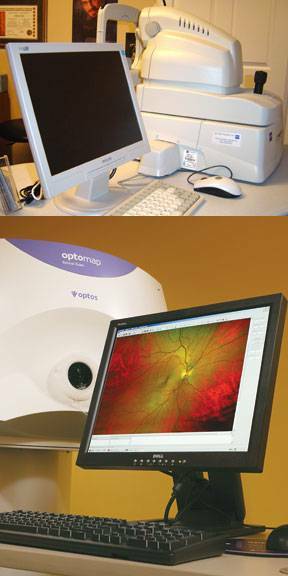 We are also pleased to announce that Optomap (bottom photo) retinal evaluations will soon be available. This advanced technology allows an amazing view of the retina WITHOUT the need for dilating drops. Unfortunately, dilating drops are still essential in some circumstances but the Optomap will largely reduce the need for them while providing an even higher standard of care for our patients.